Reach your audience on mobile. 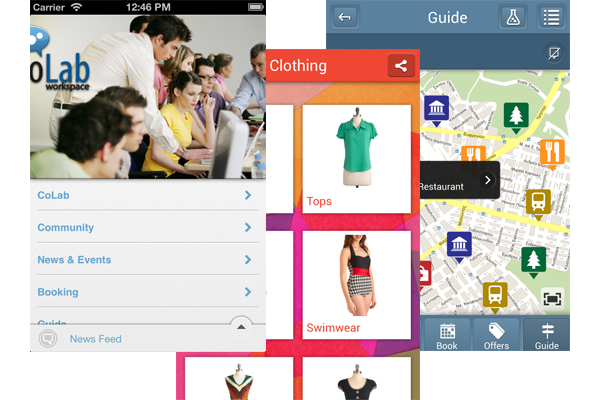 Jupitee is an online platform to create a native mobile app for your event, city or business. Manage the content and design of your mobile app from a web self-service platform, without a single line of code. Get a pixel-perfect consumer-oriented iPhone and Android app for mobiles and tablets that instantly reflects any changes you make. Increase engagement, print less and discover your attendee preferences. Trade shows, conferences, festivals. Let visitors discover the area, sights, where to stay, eat and drink. Present local businesses, share news and offers. Islands, cities, municipalities. Create an app for your business. Present services, products and send personalized push notifications. Hotels, Education, Doctors, Retail. From zero to app in a few days! Based on your branding we create your app and do the data entry. With Jupitee the whole process takes just a few days. See it live on your mobile, make adjustments and give us the go ahead. We submit your app on both Google Play and the Appstore and take care of all technical issues. Manage your app and make all those last minute changes on the spot via our online CMS. All users see the updates instantly. Have full control of your app with our CMS. Designed specifically for business users. Control colors, backgrounds, app menu, layouts to design a distinct app that matches your brand’s look and feel. Let Jupitee take care of all the technical stuff and help you stay focused on your business. Be in constant interaction with your users, respond to their needs and increase their loyalty. Use Jupitee to have a mobile app that directly integrates with the following systems. Loyalty systems for large enterprises. Live Q&A and polling for events.